Kristin Scott Thomas steps into Helen Mirren’s original (and multi-award winning role) of The Queen in a West End revival of The Audience, set to begin previews at the Apollo Theatre in April 2015. Peter Morgan’s original book, which dramatizes imaginary meetings between the Queen and the string of Prime Ministers who have served her since her coronation, will be adapted for the 2015 stage revival. The creative team have revealed that the show will now feature former Labour Prime Minister, Tony Blair. Moreover, Morgan is preparing to write in a new character following the 2015 election which could see Ed Miliband or Nigel Farage take to Number 10. From Churchill to Cameron, the play imagines the exchanges between the Queen and the string of elected leaders of the United Kingdom who have served under her, including Iron Lady Margaret Thatcher. Whilst fraught with obvious tension in places, The Audience is also filled with delightful moments of comedy, for example one sees the Queen's struggle with technology as an elderly lady. Following a critically acclaimed run in the Old Vic's Electra, Scott Thomas takes on the Olivier Award winning role in The Audience, presenting the Queen over the 6 decades she has been on the throne. The London revival of The Audience will run in tandem with a production of the show on Broadway, starring original Queen Dame Helen Mirren. The creative team of the show include director Stephen Daldry (Billy Elliot, Skylight) Bob Crowley as designer and Paul Arditti as sound designer. 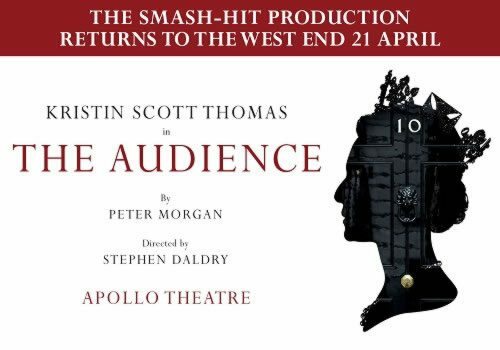 The Audience is set to begin previews on the 21st April 2015 at the Apollo Theatre, Shaftesbury Avenue (right next-door to the shows original home at the Gielgud Theatre.) Press night will be held on the 5th May 2015, just two days before the UK general election. The Audience is set between 1953 and the present day and is largely dialogue focused. The Audience is not specifically aimed at children, but young history buffs over the age of 10 may enjoy the show.